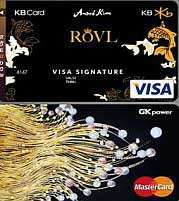 Kazkommertsbank now offers a credit card with MasterCard that is laced with gold as well as a real diamond. Annual fees of the card are approximately $1000 USD and boasts a credit limit of 50,000. The card itself, comes in two versions (his and hers), his featuring a picture of a winged horse, and hers featuring an image of a peacock. There is no doubt that this card is bling, but can we really be slowed down with that 50k credit limit? Regardless, only about 1000 cards are said to be issued in total, at a rate of approximately 30 a month.